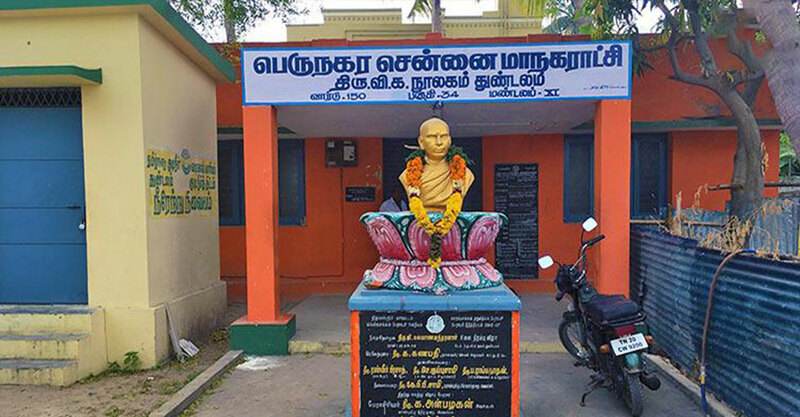 Thiruvarur Viruttachala Kalyanasundaram or T V Kalyanasundara Mudaliar, famously referred to by his initials, Thiru Vi Ka was an important Tamil writer who also took an active part in the Indian Independence movement. As a way of recognising the writer and his contribution to Tamil literature, the city has a number of landmarks to his name. The Thiru Vi Ka bridge in Adyar, Thiru Vi Ka Nagar, Thiru Vi Ka Park in Shenoy Nagar and more. There’s also the Thiru Vi Ka Government Arts College in Thiruvarur. On a bright sunny afternoon, a couple of men sit outside the Thiru Vi Ka Library in Thundalam near Chettiar Agaram road in Thiruverkadu. A temple right outside the gates stands as its landmark. “The library opens only in the morning,” one of the men tells this writer. The small building is unimpressive except for the golden-coloured bust of the Tamil scholar perched at the centre of the small courtyard. Beyond the statue reads “Thiru Vi Ka Library, Thundalam”. Thiru Vi Ka was born in Thundalam village (then Thullam) in 1883 in the present Thiruvallur district near Chennai. But was he born in this precise building? “No, he probably came here when he was three years old,” muses RG Venkatesan, a member of the Thiru Vi Ka Association. “When plans to erect a memorial for the leader arose, they chose this place and a library was inaugurated,” he adds. “That’s my name down there. I was then the Karambakkam Panchayat’s vice President when the library was built,” he points to the cornerstone bearing the names of those present during its inauguration in 2000. Thiru Vi Kalyanasundaram played a pivotal role in revolutionising Tamil prose. The legendary figure was also known for his campaigns on labour rights. The renowned scholar had written nearly 50 books on varied subjects. An ardent follower of the teachings of Vallalar Ramalinga Swamigal, Thiru Vi Ka was called Tamizhthendral (Tamil breeze) by many. Some of his most notable works are Pennin Perumai (Woman’s glory), Manitha Vazhkkaiyum Gandhiyadigalum (Human life and Saint Gandhi) and Murugan (Azhagu)(Murugan alias beauty). He had also written commentaries on the Thirukkural and Periya Puranam. Having studied in Wesley College High School, Thiru Vi Ka joined the Tamil national daily Desabakthan in 1917, serving in it for more than two years. In 1918 Thiru Vi Ka along with the support of Bahman Pestonji Wadia, also the founder of Indian Institute of World Culture (IIWC) in Bengaluru, was responsible for the establishment of the labour movement for the first time in South India. In 1920, he started his Tamil weekly Navasakthi. With his active role in the Indian freedom movement, he became a member of the Indian National Congress, soon rising to become the President of the Tamil Nadu Congress Committee in 1926. He was 71 when he passed away at his residence in Ganapathi Mudali Street, Royapettah in 1953. A hundred years since he first began the labour movement in the state, Thiru Vi Ka still remains a figure that many in the state look up to as an inspiration. The library in his name with just a couple of racks and benches inside remains shut during the day. “You can come here in the morning if you’d like to read the paper,” says Elumalai before he begins to eat his lunch outside locked doors.